Cortland, New York (Nov. 13, 2017) – Automotive Lift Institute (ALI) members elected the 2018 board of directors at the organization’s annual meeting Oct. 29 in Las Vegas. Stet Schanze of Gray Manufacturing Company (St. Joseph, Missouri) was elected to a third term as chairman of the board for the trade association dedicated to vehicle lift safety. In addition to Schanze, returning members of the board for 2018 include Jeff Kritzer of BendPak (Santa Paula, California), past chairman Jerome Lentz of Challenger Lifts (Louisville, Kentucky), Stan Poweska of PKS Lifts (Ancaster, Ontario), Harold Yeo of TLS Lifts (Oakville, Ontario), Matt Webster of Vehicle Service Group (Madison, Indiana), Associate Class representative Buck Gasner of DEKRA North America (Marietta, Georgia) and ALI President R.W. “Bob” O’Gorman. The ALI Board of Directors is comprised of representatives from the North-American based vehicle lift manufacturers that are members of ALI, as well as an elected representative of the ALI Associate Class. ALI Associate Class membership is available to North American service organizations with at least one ALI Certified Lift Inspector on staff. 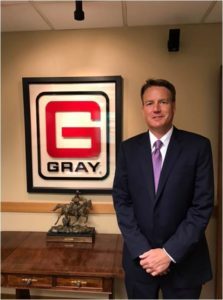 Caption: Stet Schanze of Gray Manufacturing Company was elected to a third term as chairman of the Automotive Lift Institute (ALI) Board of Directors at ALI’s recent annual meeting.